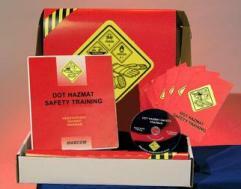 MARCOM's "DOT HAZMAT Safety Training" Regulatory Compliance Kit™ focuses on employees who handle hazardous materials. The program makes employees aware of the hazards associated with the materials they handle... and shows them how to work with these materials safely. Created specifically for the Department of Transportation's HAZMAT Training regulation on Handling and Transporting Hazardous Materials, this kit provides the "Safety Training" required by the regulation. (While this kit can be used by itself, it can also be used as a companion product to MARCOM's DOT HAZMAT "General Awareness" kit). Materials in the kit include a videotape program, five motivational posters, and 30 employee booklets. The posters in the kit emphasize the importance of being aware of the dangers when working with hazardous chemicals. The videotape and employee booklets include information on the regulation itself, hazardous materials that employees may encounter, hazard "indicators", such as labels, shipping papers and placards, the use of personal protective equipment, proper handling procedures, methods and procedures for avoiding accidents, accidents/emergencies involving hazardous materials, spills and cleanup procedures, security issues and more. The videotape program in the kit comes with a comprehensive leader's guide, reproducible scheduling & attendance form, employee quiz, training certificate and training log.